How is it we are taught to love, work, marry, and procreate, but no one teaches us how grieve? The Victorians had it down to a science. They even had a parlor in their homes where they hosted the funerals of deceased family members. That’s where the term funeral “parlor” came from. People wore black for a designated length of time, and grieving families were not asked to socialize. The only thing expected of them was to rest and recover from their loss. As chunks of time passed, certain “social privileges” were reinstated. After the death of my son, I found myself struggling for direction. I decided that the Victorian guidelines seemed worth resurrecting; I especially liked the rest and recover strategy. This was exactly what I was looking for. I couldn’t help but think that a step-by-step guide for grieving in the 21st century existed somewhere. All I can say is that if one exists, it did not cross my path. Due to the lack of availability, I decided to create my own “Mourners Guide.” Even in my state of confusion, I realized that if the basic issues could be identified, they would be a whole lot easier to deal with. Due to the circumstances of my son’s death, I included a few that relate specifically to suicide. Too often families will lie about the cause of an unnatural death, due to the shame/guilt that is often associated with them. Telling the truth about suicide leaves little room for lies or innuendo. All that is left to question is the reason why your loved one chose to take their life, and that was something no one ever really knows for sure. Many people will approach you and tell you that they feel guilty about something they could or should have said or done. This is something you can control by NOT speculating. Thank them for their concern, but always keep sight of the facts. Don’t get caught up in their need for absolution. Your number one priority is you and your immediate family. Address the concerns within that nucleus, and stay focused on recovery. #3 – Take the help offered from family and friends. Fatigue can besieged each waking hour. You may not have the energy to clean the house, walk the dog, or cook dinner. Even the simplest of tasks can often feel impossible to do. When this happens, take the help you’ve been offered by family and friends. 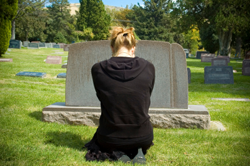 After the funeral, many people hesitate to contact you because they won’t want to “impose”. Don’t wait for them to show up. Call them and tell them what you need. They will be glad that you did, and having them to turn to will get you over the hump. #4 – Take time off to grieve. After the funeral, the very thought of returning to your job may still completely overwhelmed you. You may ask yourself, “How can I make it to work if I can barely make it out of bed?” Not to mention the fact, that your powers of concentration may all but abandoned you. It is important to take the time you need to get yourself together. Remember: You aren’t going to be any good to anyone else until you do. #5 – It’s okay to grieve at your own pace – your own way. It is a fact that we all grieve differently. We expect family to feel exactly the way we do, when we do. When they don’t, it can hurt and confuse us. Take into consideration this one simple fact: All of your actions and reactions may be different, simply because you are. What’s important is that everyone understands that this is normal. It takes the pressure off to know that although everyone is grieving, they aren’t all expected to approach it in exactly the same way. #6 – People say STUPID things. “They’re in a better place,” or “You have to move on” are things people are taught to say – but to the bereaved they are painful to hear. In the beginning of grief it is hard to believe anyplace is better than where you are, and ‘moving on’ is the last thing on your mind. “I know how you feel,” should never be said if you haven’t experienced the type of loss at hand. As a society, we are poorly educated on grief. With this in mind, understand that people don’t say these things to intentionally hurt anyone – It’s just that they don’t know any better. #7 – The first year of mourning is one step forward, three steps back. It is a fact that the first year is the worst. Getting through all the “firsts” (first birthday, Christmas, anniversary, etc.) without your loved one is a real challenge. Everyone wants the quick “cure”; unfortunately, it will require time and work to heal. For the most part, the death of a loved one isn’t something you “get over.” Grief is a process; you will become much better at coping with loss as time marches forward. #8 – Don’t make any major decisions/changes in the first year. Don’t worry about anything except maintaining the status quo for a least a year. When it comes to advice, this may be the best you’ll be given… Don’t sell your home, get a divorce, or quit your job. Your emotions are on a roller coaster that first year, and it is not the time to make life-altering decisions. Everyday life will be enough of a challenge for you to get through. Just do the best you can, with what you have, until your life regains some form of stability again. #9 – Brace yourself – Grief triggers are everywhere. You never know when or how grief will strike. There are little things called ‘triggers’ that grief uses to knock your legs out from underneath you. These triggers can be people, places, objects, or songs – literally anything that recalls a special memory of your loved one. Triggers will create an emotional reaction that you will find difficult to subdue. Go with the flow…there is no point in worrying about something like this because it is out of your control. You just have to deal with it when it hits, and work your way through it. #10 – Have a plan for the holidays and special occasions. Holidays, birthdays, anniversaries, and special events are easier to get through if you have a plan. Don’t wing it or you’ll end up sitting home alone and feeling miserable. Schedule the entire day and fill it with things to do, places you can go, and people you can see. Change your regular routine and give these days a new feel. If you always cook Christmas dinner, then ask another family member to do it this time – or plan to spend the holiday out of town. No matter what you do, you will still be thinking of them, but if you keep moving, you won’t be dwelling on the pain. Think of a way to honor your loved one on these occasions by doing something special, like lighting a candle, reading a poem, or saying a special prayer for them. This will help the lingering sorrow because it is a way to acknowledge their memory, and nothing feels more important to us than to know that they are being remembered. Sometimes the pain of loss can feel so intense you may wonder how you will ever get through it. If this happens – just remember to breathe. There are circumstances when that may be all you feel capable of doing and that’s perfectly okay. When all else fails, just keep it simple and focus on that one little word – breathe. That much you can do. When we experience losing a loved one, we can choose to work through the pain or we can succumb to it. I won’t lie – it is much harder to work at grief, than it is to let it engulf you. That’s why they call it WORK. Take it from a survivor: Work through it now, and address the pain, or it will follow you forever. Don’t try to make sense of your loss, simply accept what you cannot change and trust that with time and effort, you will find a way to recreate your life. I absolutely love this article. In my opinion, it should be printed and sent to every single household in America, perhaps along with the next census forms! I’m so glad you found it useful! That was my intention when I created “Cliff Notes for the Beginning Griever” – to get it into every single household. I’m grateful to the “Open to Hope” Foundation, for posting my article and helping me to spread the word! Thank you so much for your suicide-of-a-child-specific points. I’m new to this, oh, so unhappy group of moms, and your words in those points are the first I’ve found. It is comforting to read the words of another mom who has “been there”. There seems to be quite a lot of material available for parents of children who have died, but not much for the mom of a sweet, kind, gentle son who just found life in this world to be too difficult. Thank you–you made my day. I’m so sorry to know your life has been touched by suicide. It makes me feel good to know that what I’ve written has brought you some comfort. I love the way you describe your son; it mirrors the way I’ve always felt about my Ryan. I found out early, that as survivors, we are the best comfort out there – for each other. Take it one day at a time. The community forums are a great place to share ( I monitor the Dreams, Signs and Connections forum). Stop in for a chat anytime…I’m listening! Thank you so much for your article. it was the first one that I could understand exactly how I feel. I lost my 32 year old son on the 2 May 2016 in a car accident, leaving a 4 and 2 year old behind.. which due to them going through a divorce I am now not allowed to see, even thought they where with us every weekend with my son…..and nothing makes sense to me..but your notes help so much! Thank you so very much.